I want to thank Laura Bartlett at Tyndale Publishing for the opportunity to review this Bible. I have a number of chronological Bibles, so I see the value in these. I believe chronological Bibles provide a wonderful opportunity for people to read the scriptures have see how the recorded events fit together. The prophets offer greater clarity when placed in their historical context. The book of Acts can have greater meaning when one is able to see what Paul was going through when he penned each of his letters. Chronological Bibles have their place and have value for the student. The 24/7 One Year Chronological Bible is a unique Bible. Not only is it a chronological Bible but it follows the success of the One Year Bible, breaking the scriptures into daily readings. Daily readings are clearly marked by the date (December 5, for example). Read just a few pages per day and you will have read through the Bible in one year. But, better than other One Year Bibles, you will have read through the Bible in chronological sequence. Included in the front of the Bible is a general timeline of major events. There were good decisions made about this timeline. For example, the reader will go through the book of Job while reading Genesis because Job most likely lived during that time. There are some other nice features to the 24/7 One Year Chronological Bible. Every reading has a “verse callout” in the margin. This is one particular verse that editors found to be an important key to the reading. I found this particularly useful, especially for memorizing scripture or for having a passage to meditate upon once your daily reading is completed. It is a great idea and great help. Since these verse callouts are not on every page, this allows for some margin space on most pages. If you want to jot down a note or two, you will have the room to do so. There is not enough room to write a commentary, but you can scribble a few quick thoughts. One other notable feature is the woodblock prints that are used artistically throughout the Bible. They are in greyscale in the upper corner of the right hand page. Typically, these are not disruptive to reading the text. But there are a couple of places where the art could use to be a little more muted to not cause difficulty reading the text. The scriptures are laid out as in a single column, paragraph style. I love single column paragraph Bible. I find that such a layout encourages reading because the text is not frequently broken by double columns. But the first thing that caught my eye when this Bible arrived was its size. If you notice the dimensions at the beginning of this post, it is nearly a square. It is compact but a couple inches thick. It really reminds me of a desk calendar. I am not sure what the reason was behind this size. It is unusual. But the benefit of a small, nearly square Bible is that it has been fitting nicely on my nightstand. Keeping Bibles on my nightstand usually causes a fight between other magazines, my alarm clock, lamp, and Kleenex box. There is not a lot of room left. But this fits nicely on my desk. The small size also feels nice in the hand, and is not awkward like I thought it would be. Though small in size, the 24/7 One Year Chronological Bible is easy to read. The font is a good size. I am one to quickly complain about small print and fonts/spacing that are difficult to read. This Bible does a good job being compact, but very readable. There is some ghosting that occurs because of the thin pages. In my opinion, the ghosting is not distracting and not as significant as other Bibles I own. However, it is there. The pages are thin and you will notice the text or verse callout on the other side of the page come through. But it does not affect my reading of the text on the page. Overall, I think this is well done for an affordable, softcover Bible. 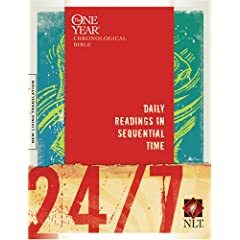 If you are looking for a daily reading Bible, this NLT 24/7 One Year Chronological Bible is certainly worth your consideration. I plan to use it as my daily reading Bible for 2009. In fact, I am already using it for December 2008. Baptism-Did God Teach Something Useless? I am very excited today because the NLT New Application Study Bible arrived in my mail. I found a great deal on the Amazon Marketplace. In a previous post I pointed out how good the study notes were. So I picked one up for myself. There is a section in the back of the study Bible called "A Christian Worker's Resource." One of the articles is about how to become a Christian. After being severely disappointed with the ESV Outreach New Testament and how it teaches bringing people to Christ, I was curious to see if there was any mention of baptism.